Popular destinations in and around the North York Moors include Helmsley, Kirkbymoorside, Pickering, Ryedale, Rosedale, Rievaulx Abbey, Mount Grace Priory, Hutton-le-Hole, Thornton-le-Dale and Goathland (famous as the location for the filming of the popular TV series "Heartbeat"). To the west of North York Moors themselves is the Vale of York and the Vale of Mowbray (spectacularly overlooked by the white cliffs of Sutton Bank) and the market towns of Boroughbridge, Northallerton and Thirsk (the latter being famous for its associations with the English country vet James Herriott, whose practice also took in parts of the Yorkshire Dales - Yorkshire's other great national park). 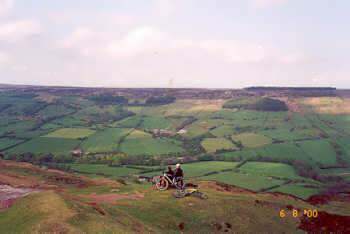 Running along the western and northern edges of the North York Moors are the Hambleton Hills and the Cleveland Hills respectively, while to the east is the Yorkshire Coast, and the popular seaside resorts of Whitby, Scarborough and Filey. The North York Moors Railway runs through the heart of the moors, as do the Cleveland Way, the Lyke Wake Walk and Wainwright's celebrated Coast to Coast long distance footpath. To the south of the North York Moors lies the Vale of Pickering, and the gentler hills and valleys of the Yorkshire Wolds. 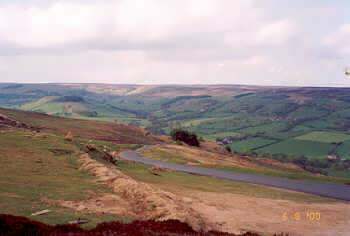 Please click here for links to other North York Moors related websites.